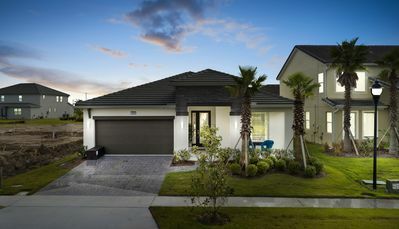 Aladdin at Encore Club in Reunion is an 8-bedroom air-conditioned luxury home that sleeps 16 people in complete comfort. While you’re staying at the Encore Club, you can take advantage of the massive new clubhouse complete with a full-service dining room and bar, fitness center and the Surfin' Safari, an incredible water park with 4 looping slides, indoor kids club house area, full service poolside bar and grill and cabanas with free wifi. Encore Club even includes a free shuttle van to Disney World, and Universal (saving you on parking and rental car costs). Encore Club is a brand new resort that opened March 2016! There are no extra fees at check-in. 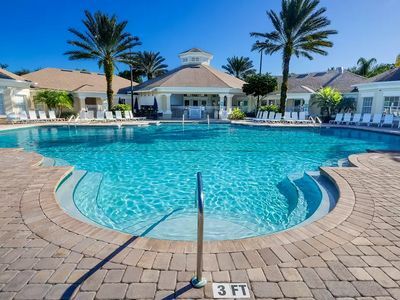 Your rental includes access to the Encore Club amenities and pool heat for your private home. When it's time to pull the kids away from the Encore Club recreation area, they'll quickly &quot;recover&quot; upon entering Reunion Aladdin. The first floor of the house is the living and dining area, with a large master with king and ensuite bathroom plus a 2nd king bedroom next door to a bathroom. The second floor has 6 bedrooms -- 4 of them suites with a full bathroom with a 5th bathroom serving the twin bedroom and 2 Doubles bedroom plus a lounge and a sitting room, not to mention that all-important media/lounging room. The media room also features a DVD Player and a Soundbar. Not to mention, it has a state of the art dartboard! 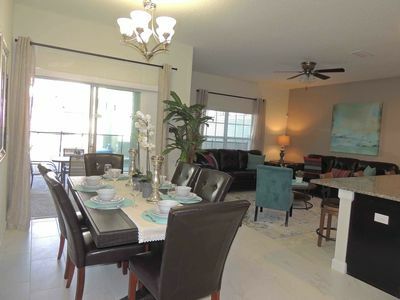 At the rear of Reunion Aladdin, you'll discover your private vacation retreat-- a covered lanai running the length of the house, with plenty of seating to take advantage of Florida's fabulous balmy weather with a private heated pool and heated spa. 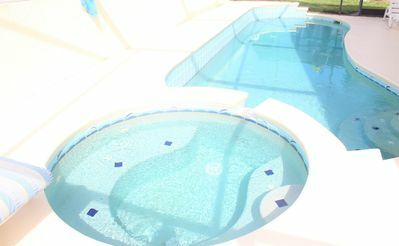 For added safety, there is a safety fence completely surrounding the pool. Parents can rest at ease knowing the private pool has a baby guard fence installed around the perimeter. 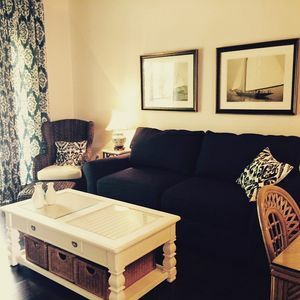 This is the place you'll want to slip out to first thing in the morning, a cup of coffee in one hand and smartphone in the other (you have free wireless Internet at Reunion Aladdin), to greet another perfect day (look for exotic birds!). It's also the spot to be when the stars pop out in the velvety night sky and you toast the best vacation of your life! When it's time to go back inside, you are faced with a choice. Should you sprawl out on the ultra-comfy couches in the great room and watch the big HDTV, or perhaps whip up some frosty beverages in the state-of-the-art kitchen, equipped with granite countertops, GE appliances, and the full complement of cookware, dishes, and utensils? --Ah, the difficult decisions of vacation time! Whether you are cooking at home or dining out during this trip, you will love gathering the group together at the huge dining room table. How often do you all get to sit down for a minute, share the small talk that is at the heart of family life, and appreciate how fortunate you are to all be together again? Reunion Aladdin makes it possible for the whole group to share one (very big!) space. And when it's time to retire for the night, you will look forward to the sanctuary of your master suite. Reunion Aladdin has two downstairs, both with king-sized beds, and HDTVs. One downstairs master has en-suite bath including a walk-in shower and dual vanities. For the second downstairs master, a nearby bath features a walk-in shower and is accessible from the hall as well. These huge rooms are ideal for parents with a baby or toddler to accommodate -- plenty of space for the Pack 'n Play! They are also convenient for grandparents or those with accessibility issues, as they are ground-floor and stair-free. You'll find that we've thought of everything! The upstairs bedrooms are spacious and, with 4 en-suite baths, designed for adults as well as children. They offer true privacy so that everyone can wind down in soothing quiet and get a great night's sleep. Many feature TVs and all have plenty of storage space and comfy beds. 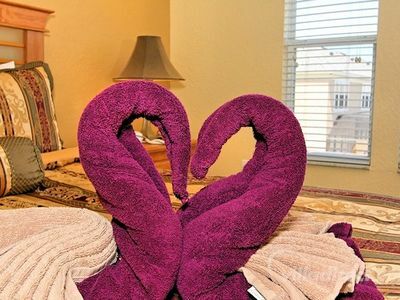 All linens are provided at Reunion Aladdin, plus all the spare pillows and blankets your big group needs. 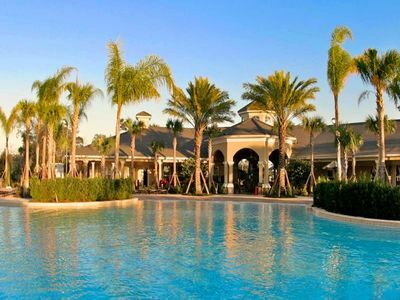 The Encore Club is a new community of new vacation homes coming to Orlando's most celebrated resort community, and just minutes from its most popular theme park attractions. As a guest, you can access Reunion's ten resort pools. Six delicious restaurants. 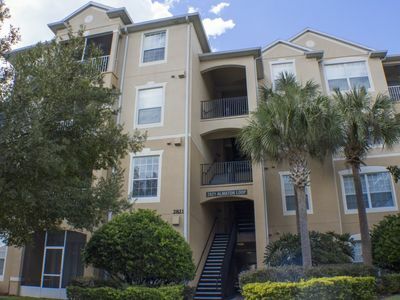 Enjoy the great outdoors with 10.5 miles of trails, bicycle rentals, two playgrounds and beach volleyball courts. And best of all, you'll enjoy an amenity-rich clubhouse and 24-hour concierge services. It’s a never-ending source of fun for your entire family. Plus, all the fun of Orlando is just minutes away. 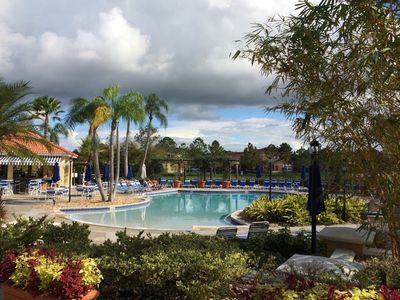 Within 10 minutes you can be at Disney World and nearby are Universal Studios, Epcot Center, Animal Kingdom, Sea World, Lego Land and a host of other must-see attractions. AWESOME! FUN! 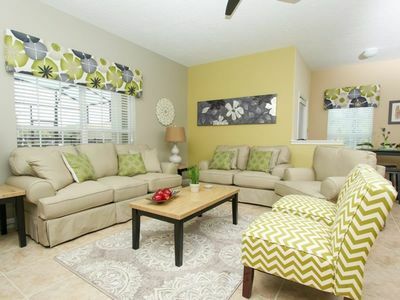 Toy Story Townhouse -1.7 miles to Disney-Sleeps 8! - Pool! 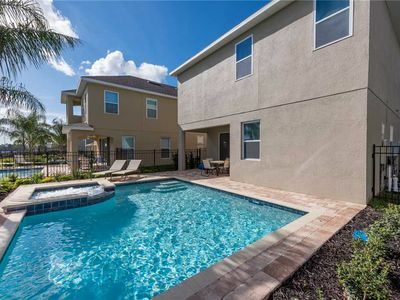 Stay in Emerald Palace - a 6 bed family pool home in Emerald Island near Disney!